This tool shows you the ultimate precise time of day. To achieve this, it uses a special internet time protocol to fetch the time from an atomic time server. We are proud to offer version 5 of the Gorgy Timing Atomic Clock. The program is one of the classic applications since the early days of the Apple App Store and has been continually improved based on user feedback. The Gorgy Timing Atomic Clock shows the precise time of day. To achieve this, it uses a special internet time protocol to fetch the ultimate precise time from cesium atomic clocks available on the internet, or any other time server you like. The graphical display mimics the clock display of the legendary Gorgy Timing clocks, which are used in professional radio and television studios, and we spent much effort to bring the original feeling of these wickedly expensive clocks to your iPhone. This app is used by BBC studios, astronomers, concert promoters, etc. * An application can not set your device's system time, so a time sync between the atomic time and the device time is not possible. * If you want to wakeup with music, please do not exit the app before going to sleep (which would result in a local notification dialog without music in the morning), but let it run with the display switched off. This application's music alarm, and this is not common, will still work when you switched off the display, even in battery mode. But be aware that running an application all the time, even without display, consumes battery, so please make sure that your iPhone is fully charged before you go to bed, or even better, connect it to your charger. Can you believe, that this is the 48th update of the Atomic Clock app since it started with V1.00? If you like the app, you can send me a small tip through the app. Thank you! Thank you very much for using Atomic Clock! To add to my original review, I really appreciate the constant updates of this app. It really shows the way "real" developers work and stand by their products. These guys (gals?) are NOT the stereotypical "hit and run" app developers. It takes REAL INTEGRITY to stand by an app from pretty much the start of the App Store (and we need all the integrity we can get these days, no matter where it comes from! ;-). I'm not sure why, but the recently added "440 Hz" mode sounds particularly cool (or maybe familiar?) to me. Give it a try, but make sure you wait until the minute changes and you get the "alternate" tone. I searched high and low for an audible alarm that was dead accurate to the second. None existed. I contacted the app developer and within a week he added this functionality to the existing app. As of the writing this is only only app out there with an alarm that can be set to the second. Yes there are countdown timers but these can not be set to alarm at a set time of day. 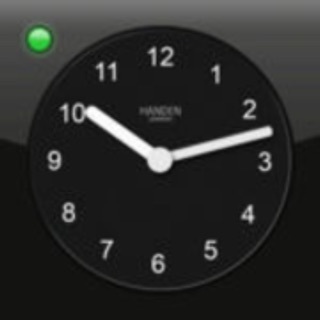 Beyond the alarm functionality, a beautiful clock as well. I use this app with it’s audible tick-tock to help set the timer on my WSPR beacon for Amateur Radio. I had a reason to contact the developers and they were super responsive. In iOS 11 the application uses the ringer volume to set the volume of the ticks. I had to go into Settings > Sounds & Haptics > Ringers and Alerts and enable the ‘Change with Buttons’ slider. Now I can hear it again on my iPhone 7 Plus after the update from iOS 10 to iOS 11.